Many many years ago my friend took me to a Korean Restaurant and ordered something called Dok Boki. It was this red sauce of delicious doom. My eyes were tearing, my nose was running I was practically crying it was so spicy. I just couldn't stop chewing though!! I have a huge love for food with odd textures. 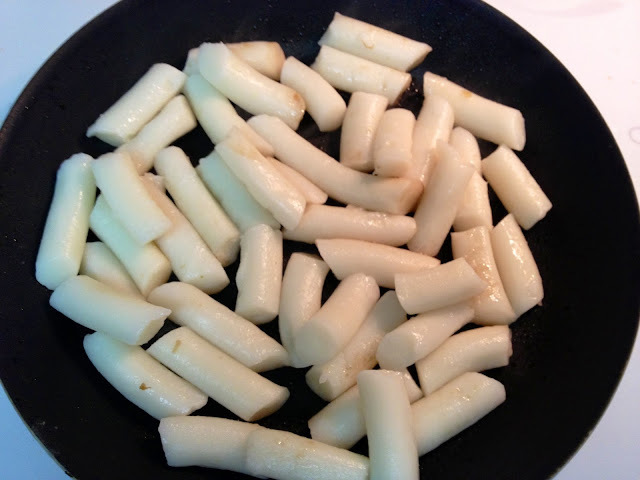 Rice cake sticks are one of my favorite things to chew. 12 years later I found these little oddities in an Asian market. My life has now changed. Mine were vacuum sealed. Open the package and soak them in water for 10 minutes. They are suppose to be soft when you cook them. If they are not soft, drop them in hot water and let simmer till they are. Heat up some oil in a skillet and throw them in. Saute til they have a slight brown color. I burnt mine a bit because I am a weirdo and like things with a charred taste. Mix up some sauce I used spy sauce, garlic, onion, chicken bouillon, bulgogi sauce and oyster sauce slurred together with water and flour. 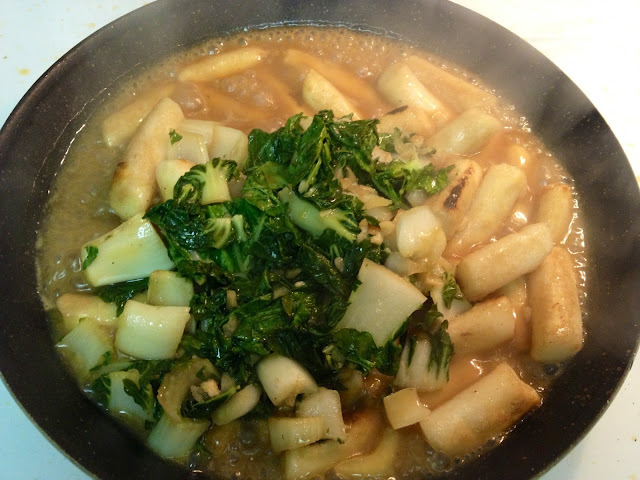 Let this thicken add veggies (I used baby bok choy) and mix with your rice sticks. So absolutely delicious ! What new old favorites have you tried lately? Yum!! So unsual but it sounds delicious!! oh you gotta look for them so good !! I like chewy things like this. They almost look like thicker Uudon noodles chopped up. I will certainly have to try these if I can find them! they kind of are but more dense and chewy. i think they are a staple in our asian markets... actually look for them next to the udon in the refrigerated section. i hope you can find them !! Oh my! I have to find these and try them! They look so yummy! I love Dok boki. There is a local Korean place that makes it with fish cakes and hard boiled eggs.